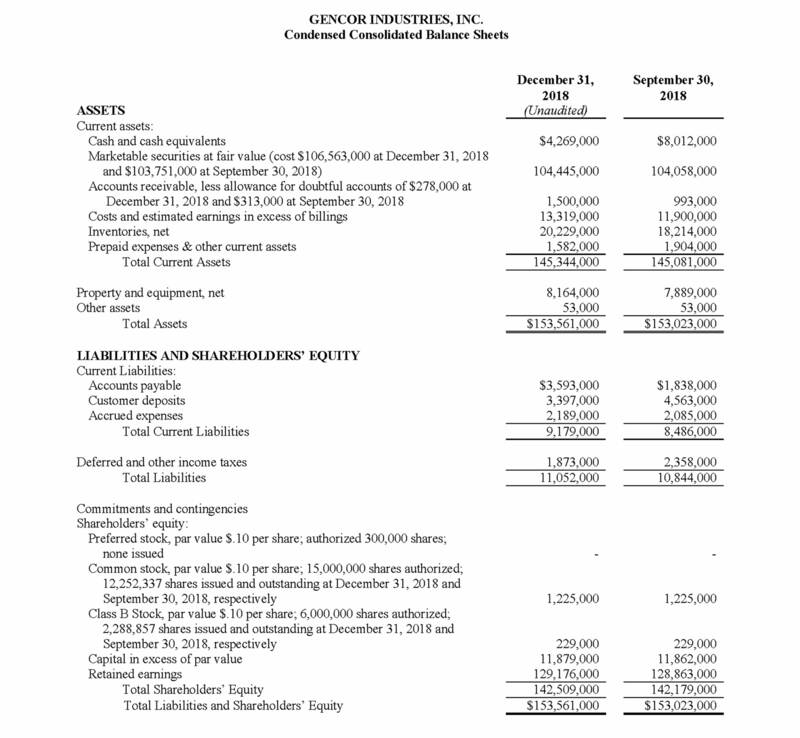 February 1, 2019 (PRIME NEWSWIRE) – Gencor Industries, Inc. (Nasdaq: GENC) announced today net revenues of $21.3 million for the quarter ended December 31, 2018 compared to $23.1 million for the quarter ended December 31, 2017. Gross margins were 23.1% for the quarter ended December 31, 2018 compared to 22.0% for the quarter ended December 31, despite higher raw material costs, as the Company continued to benefit from cost management and operational improvements implemented over the past few years. Product engineering and development expenses increased slightly for the quarter ended December 31, 2018. Selling, general and administrative (“SG&A”) expenses decreased $502,000 to $2,190,000 for the quarter ended December 31, 2018. Reduced sales commissions and advertising and trade show expenses resulted in the decrease in SG&A expenses. Operating income for the quarter ended December 31, 2018 increased 18.5% to $2.0 million compared to $1.7 million for the quarter ended December 31, 2017. For the quarter ended December 31, 2018, the Company had non-operating expense of $1.6 million compared to non-operating income of $0.5 million for the quarter ended December 31, 2017. Included in non-operating expense for the quarter ended December 31, 2018 were net realized and unrealized losses on marketable securities of $2,147,000, due to a weak domestic stock market from October through December of 2018. The effective income tax rate for the quarter ended December 31, 2018 was 19.9%, compared to a benefit of (9.2%) for the quarter ended December 31, 2017. The 2017 tax benefit resulted from the adjustment to the net deferred tax liability and applying the lower corporate tax rates to comply with the recently enacted U.S. tax law, Tax Cuts and Jobs Act (“TCJA”). Net income for the quarter ended December 31, 2018 was $0.3 million, or $0.02 per basic and diluted share, compared to net income of $2.3 million, or $0.16 per basic and diluted share for the quarter ended December 31, 2017. At December 31, 2018, the Company had $108.7 million of cash and marketable securities, down from $112.1 million at September 30, 2018. Net working capital was $136.2 million at December 31, 2018. The Company had no short-term or long-term debt outstanding at December 31, 2018. The Company’s backlog was $34.8 million at December 31, 2018 compared to $50.2 million at December 31, 2017. 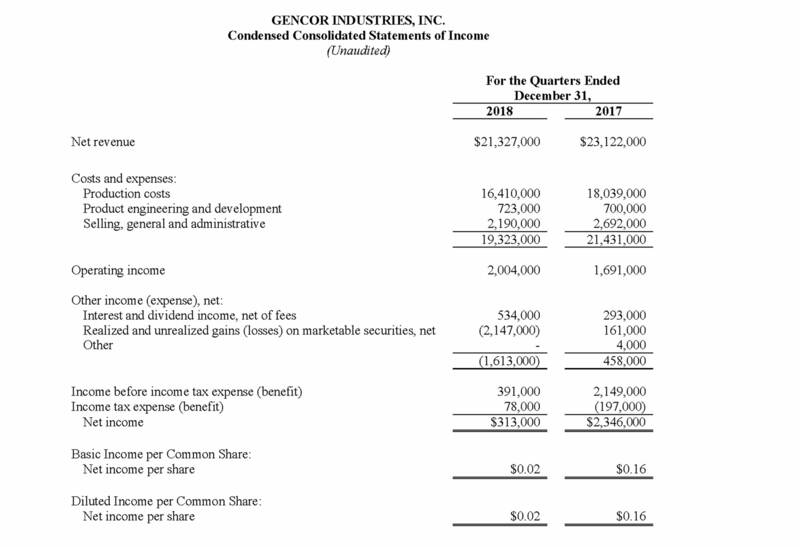 John Elliott, Gencor’s CEO, stated, “First quarter revenues of $21.3 million reflect a moderate slowdown in order activity from the prior year, when the company had record backlog and revenues. The Fixing America’s Surface Transportation Act, or FAST Act, is in its fourth year of the five year bill. The bill has provided confidence in Federal funding with moderate annual increases over the five years. Gencor has benefited from the FAST Act as many of its customers anticipated improvements in their business and therefore made an increasing level of asphalt plant and component purchases. Gross profit margin for the first quarter was unfavorably impacted by reduced volumes. However, this was more than offset by improved efficiencies and realization of cost savings initiatives resulting in a slight increase in the Company’s quarterly gross profit margin. Steel prices have stabilized since October. The Company successfully minimized the impact of steel inflation over the past two years, but still absorbed a 36% overall increase. Despite the decline in revenues, operating income and operating margins increased as the Company continued to manage expenses. Backlog of $34.8 million is 30% below the prior year backlog of $50.2 million due to a lower number of large asphalt plants orders. The Company anticipates a moderate level of order activity to continue in 2019. Caution Concerning Forward Looking Statements – This press release and our other communications and statements may contain “forward-looking statements,” including statements about our beliefs, plans, objectives, goals, expectations, estimates, projections and intentions. These statements are subject to significant risks and uncertainties and are subject to change based on various factors, many of which are beyond our control. The words “may,” “could,” “should,” “would,” “believe,” “anticipate,” “estimate,” “expect,” “intend,” “plan,” “target,” “goal,” and similar expressions are intended to identify forward-looking statements. All forward-looking statements, by their nature, are subject to risks and uncertainties. Our actual future results may differ materially from those set forth in our forward-looking statements. For information concerning these factors and related matters, see our Annual Report on Form 10-K for the year ended September 30, 2018; (a) “Risk Factors” in Part I, Item 1A and (b) “Management’s Discussion and Analysis of Financial Condition and Results of Operations” in Part II, Item 7. However, other factors besides those referenced could adversely affect our results, and you should not consider any such list of factors to be a complete set of all potential risks or uncertainties. Any forward-looking statements made by us herein speak as of the date of this press release. We do not undertake to update any forward-looking statement, except as required by law.